Just sometime back, my twinadoes had an invitation to attend their friends’ birthday party. Papa also obliged to join us and we had an experience of a lifetime! 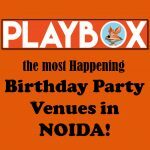 There have been fthun birthday party venues in Noida that are fairly new, and we never knew about! We reached this particular location and were blown away. It was a play area with a twist – so they had separate sections for older kids and younger kids, making it a more reliable option. While kids enjoyed their day at the birthday party, the twinadoes gave me a sleepless night, craving to go back to Playbox Kids. So next day we did take them with us to Playbox Kids and explored the vicinity even better. I truly feel that Playbox Kids is one of the most happening Birthday party venues in NOIDA. Let Mummasurus take you to a tour of this rocking place! Playbox kids is located in the Lower ground floor of Gardens Galleria Mall, Near The Great India Place, Sector 37, NOIDA. As you reach there, you see card-operated games, huge buses, Tom & Jerry ride-ons and other such games. It was a task to drag the kids from there so we could get inside the play area at all. You then reach the reception where you have to register and share your details, including your phone numbers, so if you are not around and the child needs you, you are just a buzz away. Parents are given pink bands and kids are given blue/orange bands and are greeted with a smile. There are lockers where you can store your items, just in case you are back from shopping or so. You are also required to take your shoes off in the vicinity, yet, mandatorily have socks on at all times. In case you’re not carrying any, you can buy a pair from the reception. This play area is a complete soft zone and has very interactive and fun games for children above 2 years old and about 4 years old. It has small window games, slides & tunnels, corners dedicated to building a wall with sponge bricks, or using tools for engineering like the hammer. They also had a corner dedicated to role playing as a cook. They also had a massive ball pool with flying balls in between. My kids had a crazy time here. They were constantly on the go. This play area involved activities of rigorous play meant for kids 4 years & above. This area has huge air & ball guns (all absolutely soft & safe), big tunnels, bridges, slides, trampolines & hoppers. They do have helpers & attendants in both the play areas to assist the children and keep them safe while they have a blast. The Snack Box or the cafe area is well-lit. The food served is totally healthy, as the company absolutely believes in the NO JUNK policy. Healthy food materials like honey instead of sugar, yogurt, whole wheat flour for breads, freshly cut fruits, air-fried & baked items instead of deep fried items are used. The cafe area is also strategically located around “My Burrow” and the “Show Box” where parents can keep an eye on the little ones in these areas, while they enjoy a quick snack or a coffee. Here is a picture gallery of the yummy food we tried. The Party rooms are well lit and beautifully decorated. The rooms are large enough to occupy 30-35 adults at a time, with kids. These rooms can be merged if the attending group is a rather larger number of people. The seating is comfortable and there is enough free space for kids to play games at the birthday celebration. Show Box is a studio that is designed to conduct workshops. These can be for parents, while the kids enjoy their time in the play area. Or for parents & kids, learning things together and bonding better. My Burrow & My Maze play areas are chargeable at Rs 400 for the first hour on weekdays (Rs 500 For the first hour on weekends). Thereafter, the charges are Rs 200 per hour, on all days. Food is available a la carte, as per price mentioned on the menu. Card-operated games are also available as per prices mentioned on the machines. Party Package details are available on request. There is a minimum height criterion in both of the play zones, which ensures that kids participate in activities that suit them most. A 4-year-old high energy kid may want to go to the Maze instead of the burrow and vice versa for a moderate energy kid. There is a Barricade at several points ensuring safety. So just in case, a kid feels like a tornado and wants to run around or wants to walk out unaccompanied, the same can be managed and controlled. Even if you have a day to just while away, grab hold of some of your friends and let the kids play in the area, while you and your friends sit down to have a coffee and some chit chat. I met this gorgeous lady there who was out to have some ‘Me Time’, as one of her older kids played in ‘My Maze’, while she sat down with a coffee and a fresh fruit salad, offering the same to her 8-month-old. There is first aid and other help available at all times. They also have donation boxes where you can drop in your kids’ old clothes and toys. The kids learn to drop these items on their own, thus learning the virtue of giving, and letting go of their old favorites. In the “My Burrow’ play area for younger kids, a parent is allowed to accompany the child. However, it is not mandatory. Why do I call Playbox Kids one of the most Happening Birthday Party Venues in NOIDA? There are Abundant attendees in the play area to assure security & safety of the kids. You will also witness the staff being playful with the kids, adding on to their fun experience. The food served to kids is totally healthy. Smoothies are made of yogurt and Honey, pizzas are made of brown bread, snacks like french fries or nuggets are air-fried. They also have a variety of salads & fresh-cut fruit platters that will make it a delight for the kids. So an ABSOLUTE NO to junk food. Their birthday packages not just involve food, but also a playtime in the play zones which is a riot. Kids with all their friends, raiding the play zone – it is a treat to watch all the kids go berserk with the excitement. It’s a happy chaos among a generation which would prefer staying glued to their gadgets. This is one of the key aspects that make Playbox Kids one of the best birthday party venues in NOIDA. Their birthday celebration areas are 2 in number. So you may use anyone for a smaller group. If you have a larger group, they can merge the two rooms completely and arrange for fun activities accordingly. I really liked this idea, so you have a close-knit small group or a spacious enough large group! If the group is heterogeneous, with kids across age groups, it sweetens the pot as Playbox Kids have engaging play areas for kids across age groups. It is going to be difficult trying to pull your kids out of the play zones. They are going to be so happy, that taking 2 hours for a minimum is the only thing you could do. So if you have an urgent appointment, this may become an obstacle in your punctuality. It’s good to take some extra time at hand before you register your kids for a certain time. The place could seem expensive to some. No other mascot or cartoon, except J are permissible. Playbox kids is soon to come up with one day, as well as monthly plans for activities including Mother or both parents and the children. For example, Zumba, drumming, paintings, and other such fun activities, where families spend more times together. I, for one, am desperately waiting for these! I absolutely loved this place! It is one of the best birthday party venues in NOIDA for kids across age groups. Must visit if you stay in and Around NOIDA! To know more about them or for packages, bookings or any other queries, you can reach their website here. If you loved reading this article, don’t forget to SHARE it with your friends, especially the ones who are planning a birthday party soon enough. You may also like to read Buying toys is not a Child’s Play! I’m taking my Alexa to the next level, what about you? If you get any such place for kids birthday it’s like 90%tension is gone .. This is some amazing place to throw a birthday party. Let me know if tehy have a branch in Gurgaon. thanks for sharing the info for this place. This looks like an amazing place. I remember seeing your video in which you showed the real fun you and your kiddos had. Amazing!! I like the specific names they have assigned to the different sections of the play area. This looks like super-fun, especially the role play activities. This is such a nice concept of having birthday party venues in such a grand way. A child can have a blast with his or her friends in such a place. Great write up. The place looks fab. I’d love if you could mention a similar party or play area in Delhi too. Looks like a fun and perfect place for kids. Looking at these fancy venues I remember how simple and pain jane our birthday celebrations used to be. Today’s kids are so lucky they have such fun places to enjoy birthday parties. The place look really happening. Its for sure a great place for kids. Happy to learn from you that they give equal importance to safety. Sounds like the parent’s version of heaven. It is commendable that they only have healthy food options and kudos to them for being able to keep the kids engaged and enjoying themselves. Looks like people in NCR have something exciting in their vicinity. Cool pics and things this place has for kids. Looks like a fun place for kids- my kids will not want to come out of here ! Looks to be quite an amazing place for kids. By the way have you been to Kidzania. I guess in India they are only in Mumbai. I have been to the one in Kuwait and I must say their concept of fun for kids in the form of education is pretty awesome! loved the review 🙂 so detailed that i dont have to look any where else ! Looks like a paradise for kids. Lovely concept. Ideal for kids parties. This place looks superb!! Such venues really take off stress from the host’s shoulders. Everything for fun and play is right there. It’s always fun to hang out with your mommy friends. Thanks for sharing. Wow. Such a lovely place. The best part I liked is the security system and healthy food served here.